You may have seen Austin Stevens on TV and now he's talking to ePz about nature and how he captures it through photography. Austin Stevens is the snakeman, a herpetologist, an adventurer, author, filmmaker and a photographer who took some time out to talk to ePHOTOzine about his many roles and to share a few tips on wildlife photography. Which came first your fascination with wildlife or you liking for photography? I had never touched a camera until I became professionally employed at a snake park. Suddenly I had access to all these wondrous reptiles from around the world, reptiles of every colour and of every shape. So I bought a little happy-snap camera. However, within a short while, realising that I was not doing these magnificent creatures the justice they deserved, I progressed to a better camera, one that had inter-changeable lenses, especially macro lenses. Here now I could get down to fine detail, showing all aspects of the wonderful colour patterns and scale formations of these reptiles, amongst other features. Soon I was photo crazy, shooting up roll after roll, until eventually I began writing articles about these exotic creatures, and supporting the articles with my own photographs. (Over the period of my writing, I had over 150 wildlife articles published in South Africa, and around the world). Is photography something you do as a hobby or is it a skill you use to just document and record the reptiles and other animals you've worked with? A short history: At a time when I was performing lectures and public reptile demonstrations at the Snake Park where I was employed in the early years, South Africa had just launched it’s first Television station, and it was not long before a team turned up at the park to film one of my shows. This led to an offer to do a show in the Johannesburg studios, bringing all my reptiles with me, for a program called COMPASS. This I did, and the show was so popular, I was asked to come back to do 2 further shows. At the time I was fully concentrating on slide photography only, and it was only many years later, after I had moved to Namibia, that I myself first got behind a movie camera, and made my first TV documentary film about the life of snakes. 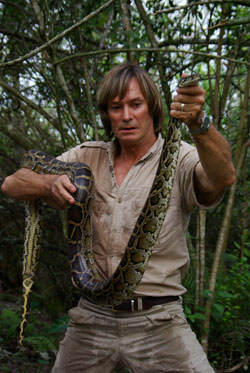 This I did for NDR Television, Germany, and called the film, The Nature Of The Snake. Later I changed to Video, and made a documentary film about desert chameleons called Dragons Of The Namib, which was snapped up by National Geographic. Naturally all the while I was supplementing my work with an endless stream of slide photography, which I needed for articles and promotions. Soon I was being asked to help out with various film projects from overseas, especially UK based companies, where snakes were being featured. Then one day I was approached and asked if I thought it might be possible to do a whole adventure documentary involving the locating and photographing of venomous snakes around the world. I said yes indeed, I thought this was possible, and the resulting dramatic film, Seven Deadly Strikes, became the catalyst that eventually led to Animal Planet taking notice, and the beginning of the first series, Austin Stevens SnakeMaster/ Austin Stevens Most Dangerous, to be followed by a second series, Austin Stevens Adventures. One way or another, since those very early beginnings, everything in my life has evolved around photography. It is something I automatically just came to do, sometimes professionally, other times just simply for the love of it. Do you find images are an easier way for people to understand the work you do and also the animals/reptiles that can be found on our planet? "A picture paints a thousand words" This is a very true statement, and especially important where wildlife if concerned. Never can one describe the wonderous colours to be found in the shiny textured scales of an exotic snake, or the wings of a particular humming bird. But in one close up picture, all is revealed. Most people in their life times will not see many exotic animal species in their natural habitat, especially not in close up, and so it is important to bring these animals into their homes, in the form of pictures, so that they become aware of the wonderful beauty that we still have on this planet. Hopefully this will in some small way arouse some awareness and help promote the conservation of all living species. What kit do you use? Is it a personal choice or one that makes your professional role easier? Do you have a team of people who help you carry kit or do you only take what you can carry? When it comes to my personal choice of cameras and lenses etc, I am a Canon fan. I have of course been through various makes of cameras from as far back as my first Yashica in the 70’s. My attention was first drawn to Canon when a wildlife film maker friend of mine told me to make sure I use only of the best quality lenses for adapting to my 16mm movie camera; “Like a Canon lens”, he suggested. I took his advice and was not disappointed. Since then I have stuck with Canon, though I do have a general use, out-of –production-model, Samsung Pro815 camera, which I often carry and use generally because it has a fixed 28-420mm lens that allows me to cover a large range in one. I also used a Samsung camera in some of the film shoots, with Samsung lenses, and sometimes with Pentax lenses. I myself do not have a large collection of cameras and lenses, preferring to keep my kit compact and light. When filming on location of course, my little kit of equipment is dwarfed by the loads of equipment needed for making the film series. This is a different matter all together, and often amounting to as many as 50 cases, which sometimes need to be transported into inhospitable areas of desert, mountain top, or jungle, by vehicle, by boat or canoe, or on the backs of porters hired for the job. This would include HD video cameras, 16mm film cameras, Mini DV video cameras, tripods, body cam outfits, lighting, and even a 9 metre collapsible jib, (camera crane) to mention but a few. My film crew on location would usually consist of 6 people, including myself as presenter, 2 camera people, the director and production co-ordinator, and a sound technician. For the most part my pictures are simply for my personal use to support any wildlife articles I might write, or to be used in any books I might write, e.g. my latest book, The Last Snake Man, in which many photographs are included. I am at present working on my next book concerning the behind the scenes stories about the making of my film series, and this will be supported by plenty of photography, both personal and general wildlife. Naturally pictures are sometimes also used for promoting my film series. I also have an agent in New York who holds a limited selection of my pictures for sale. How long do you spend on photography? And do you take images on every trip? I am never without a camera close by, even if it is simply my little Sony Digital Cybershot. You just simply never know when something of interest will pop up. I photograph anything that might interest me, with special attention of course given to all wildlife subjects. I do personal wildlife trips whenever possible. In doing so, I am free to take my time and go for what I want. It does not matter how long it takes. I usually travel in a campervan (e.g. when in Australia) or a 4x4 double cab vehicle when in Africa. This allows me to carry all supplies and equipment I might need with me, and leaves me free to remain in any place as long as is necessary to get a particular photograph. When it comes to big game photography, one can only wait and watch, but when attempting to photograph reptiles, I am forced to actively seek them out, as these creatures, especially snakes, are shy and elusive and not often seen in the wild. Do you have a long time to focus, frame and take shots or have you had to learn how to take good shots in very little time? Wildlife photography is largely the luck of the draw, especially when there is wild animal behavior involved. The trick is to be patient and ready for when the action hits. And at this time, should the action be fast and furious, it would be important to have camera and lens equipment that is fast enough to capture the moment. Unfortunately, I myself am not a very patient person by nature, and struggle with this part of the deal. I actually prefer something that I can help create, like a snake in a beautiful setting, where I can maneuver around the animal and specifically plan my shots. This of course can also sometimes call for fast action shooting, like when a snake is striking out, or takes off at a fast slither, but at least I have some control, and can shoot off as many pictures as I like, from a different angle and position every time. I cannot do this with a charging rhino or elephant, for example, because I have to consider my own vulnerability in getting the shot. So, while one does what one can to create a wild animal photograph of some artistic value, it is not always possible, and might depend entirely on where the animal might position itself at the time. While filming the series I was faced with a mixture of these two scenarios. Like sometimes having a cobra standing for long periods with hood expanded while I easily move around the reptile shooting off one lovely picture after another, and other times fearing for my life as an enraged black rhino charged down on me, forcing me to run for a tree. The latter producing very little in the way of beautiful photography. Do you have pieces of advice for other wildlife photographers out there? I believe that each wildlife photographer will settle into his or her own style of photography. Some, like myself, will be content to get what is possible within the bounds of practicality. I have never expected to make a living from photography alone, but rather from what surrounds it, like writing or film making, and even more importantly, just the experience of being in wild places doing it. My preferred style of photography is to get as close to the subject as possible with as wide a lens as possible, so as to encompass as much surrounding background as possible. This style of photography in the face of some wild animals might be considered dangerous and should not be attempted by anyone not familiar with the behaviour of wild animals. At the same time however, when working with smaller animals, like snakes or lizards for example, there is little to beat a good 50mm or 105mm macro lens for up-close clarity, shooting at F22, with hand held flash for great pictures in the field. Ultimately, each to his own. There are some great wildlife photographers out there who put a tremendous amount of time and effort into bringing these wildlife pictures into our homes, through books and magazines, and television. I wish only that I have played some small part in this. Visit Austin Stevens' website for more information.